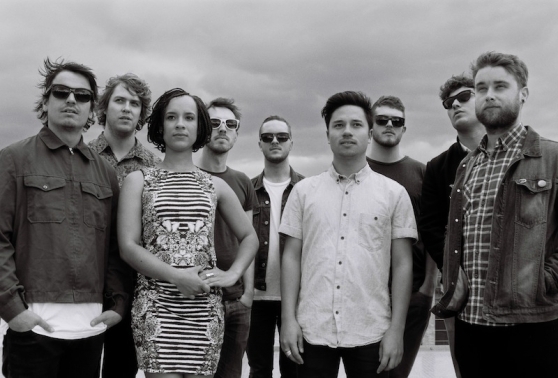 Soulful Melbourne nine-piece Saskwatch are celebrating the release of their new album Nose Dive. Trumpeter Liam McGorry talks friendship, The X-Files, and playing for children in Spain. Nose Dive is quite a shift away from Saskwatch’s first release Leave it all Behind, which came about rather unintentionally. “We started out busking without any original songs and we weren’t trying to be a band or anything, but it slowly came together over two or three years,” Liam remembers. Liam can scarcely remember a time when he wasn’t making music. While he started off with the bugle (I know, right? ), he eventually graduated to trumpet and has stuck with the brass bombshell ever since. All of Liam’s practice, practice, practice compelled him to start thinking bigger about what he wanted to do with music – and like a rebellious and curious young teenager, he used to sneak his way into bars and clubs to watch music played live. From a passionate school boy, Liam has grown into a talented young man – and with his experience he is able to kick back and enjoy the work involved in his successful musical career. One of Liam’s most memorable experiences from his time spent entertaining overseas was during a festival in the fiery nation of Spain. You know you’re onto a great thing when your music crosses the barriers of language – and age groups. The band have been crazy busy since their sophomore release, playing shows and festivals right around the country – but Liam likes to keep the momentum going strong. When Liam does get some time to himself, he relaxes like the rest of us – binging on The X-Files (he’s currently up to season three), and hanging out with his mates. He also passes on his skills to young trumpet students as a tutor, and holds an enjoyable job at Melbourne’s Northside Records. This certainly gives Liam a break from the original Saskwatch hits the muso thinks about on a daily basis – along with his eight other band members. Though Liam describes the band as a “real tight unit,” the album isn’t all about the joy and friendship they experience during their time rehearsing, gigging, and touring together. This article featured in Warp Magazine, July 2014. http://www.warpmagazine.com.au.